Today's theme is knitting vs. crochet. As you have no doubt gleaned, I LOVE knitting. It is my hands-down winner. It makes me feel very excited and I'm a fairly animated person at the best of times. I'm told I talk quickly and walk fast. I'm chatty, and my head fills with creative ideas far more quickly than I can make them. Well, multiply all that by about 100 where knitting is concerned. Right now my hands are zipping all over the keyboard and my heart is beating fast. Knitting! Yippee!! What is there not to love? Yarn, patterns, crazy techniques, fabulous creations... bliss! But, I am also an intrepid adventurer, especially where crafts are concerned and I don't like missing out when something seems fun. Have you seen some of the amazing crochet creations about? I want some of that too. So, I've had a go at crochet. And then this topic for today's post was announced and my sewing kit idea was born. 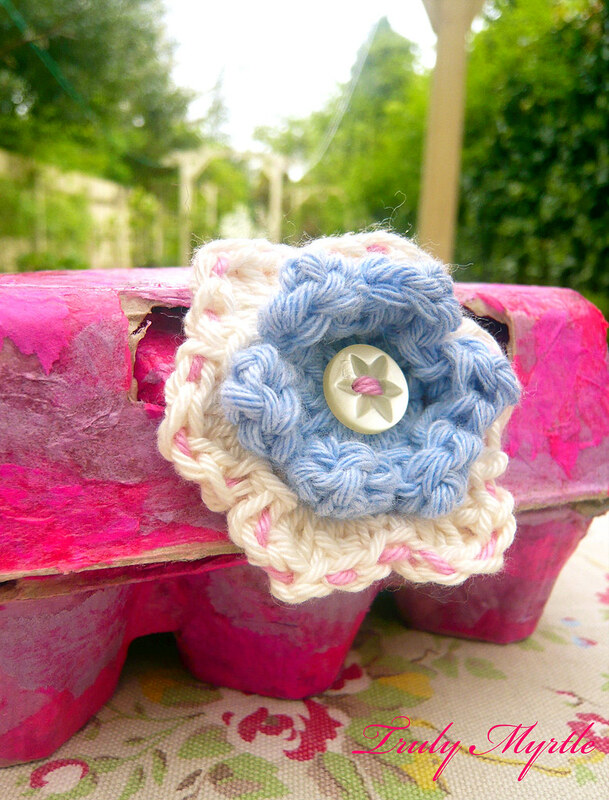 I could combine crochet, a cute egg and usefulness all in one go! My egg could be a pincushion! I grabbed an old egg carton and found the best egg pattern on Greedy for Colour. If you haven't visited Kate and seen her knitted, sewn and crocheted creations, you must! Her blog is fabulous. The instructions were great and my wee egg didn't take too long. I used a cotton/wool blend from my stash and filled it with wool roving so it was nice and firm. I stuck it into the front of an egg carton with some super fabric glue so it shouldn't go anywhere! The rest of the egg carton I filled with all those necessary bits and bobs. I'm giving it to my dear niece for her 8th birthday, so it is a starter kit. 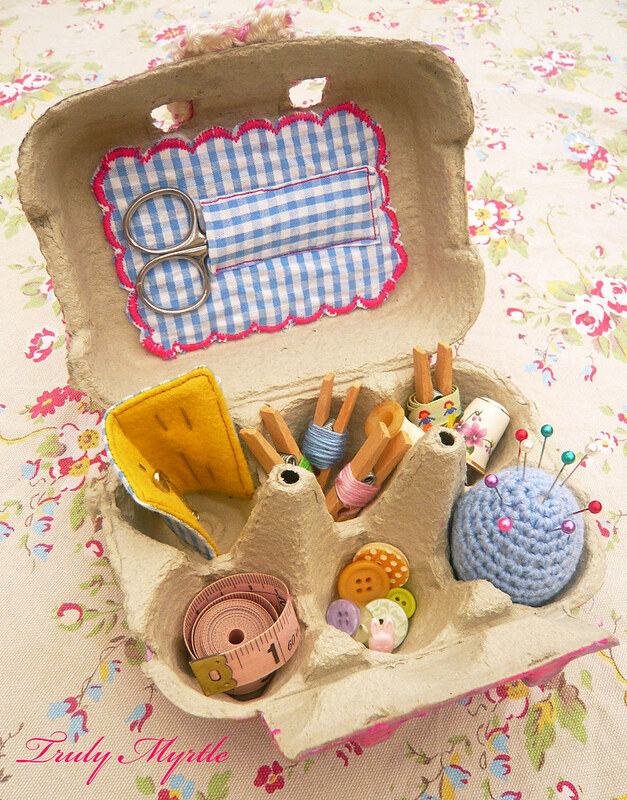 There are some small scissors in a little padded pocket, a thimble, cotton, buttons, a pretty pink tape measure and I made a tiny needle case with yellow wool felt. Don't you just love those dolly pegs for the cotton? Oh, I think they are soooo sweet! I spent a happy afternoon with Nelly decorating the outside of the egg carton with tissue. We used lots of tiny pieces of torn pink and lavender tissue, layer upon layer, and lots of PVA glue. It really strengthens the box and the hinge, and adds a deep glossy colour. A bit more interesting than just paint. But, it needed something more. 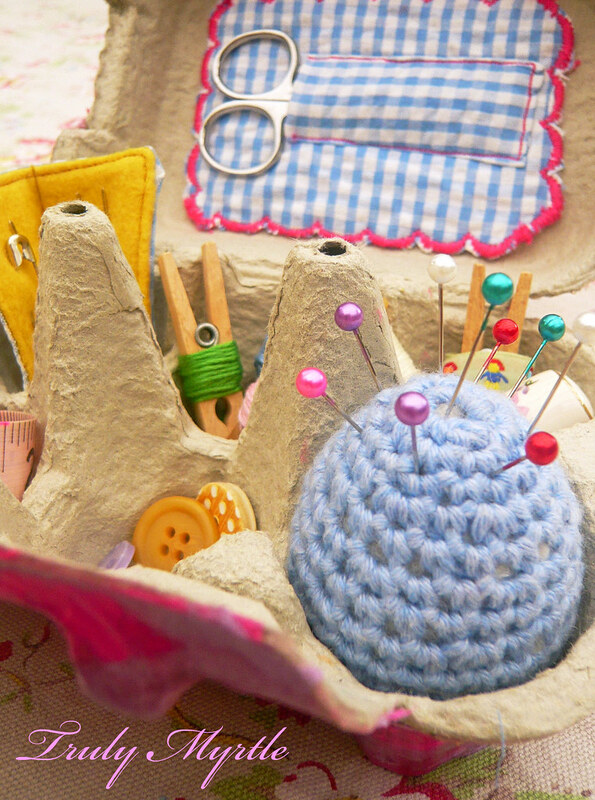 So, I turned to the mother of all crochet blogs, Attic 24 for inspiration. And I found it! My lovely flower is from Lucy's flowers and leaves tutorial. Mine is a nervous little thing, a wee bit wobbly! 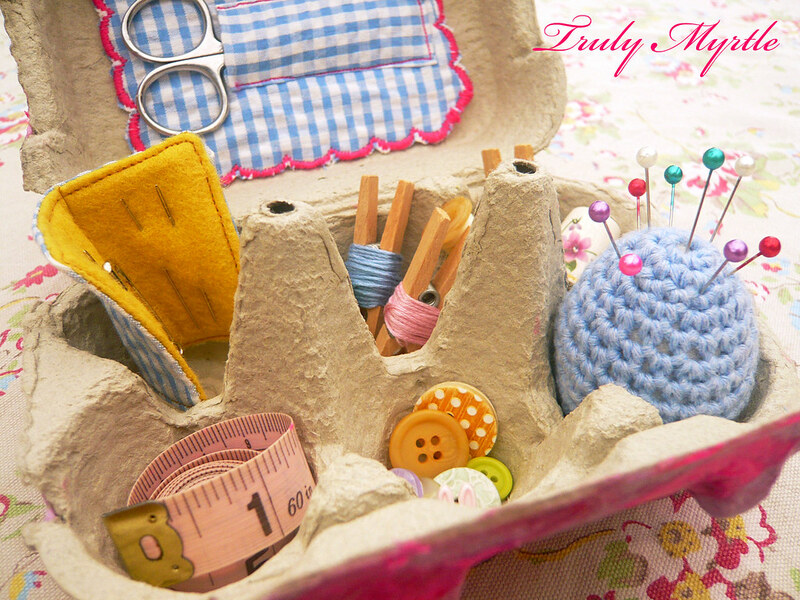 I had to learn a few more stitches, but her instructions are fantastic and I got there in the end. 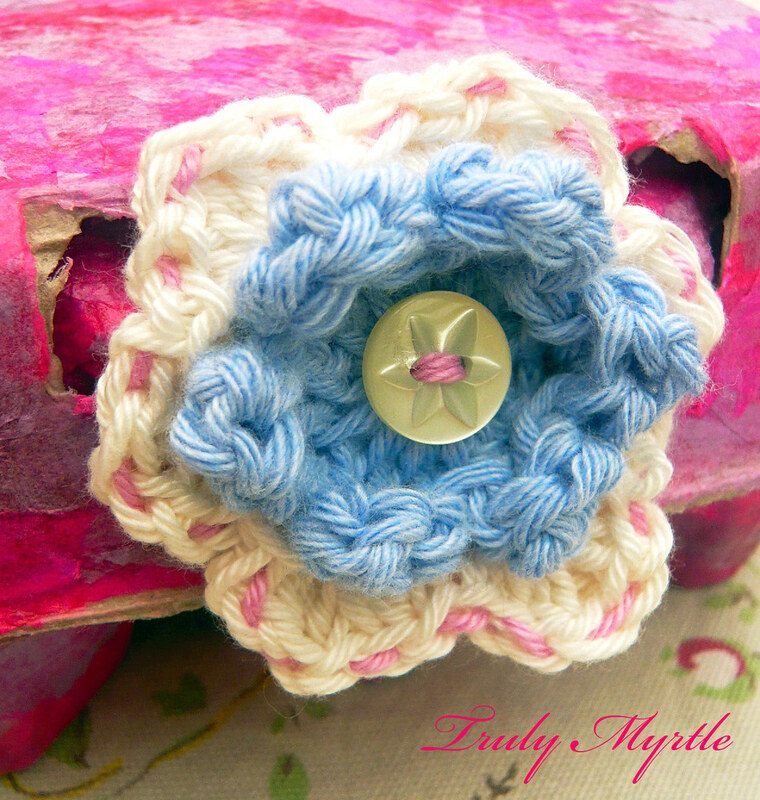 I finished by sewing a running stitch in pink around the edges to pretty it up, and tie it in with my pink box. And so, there you have it. 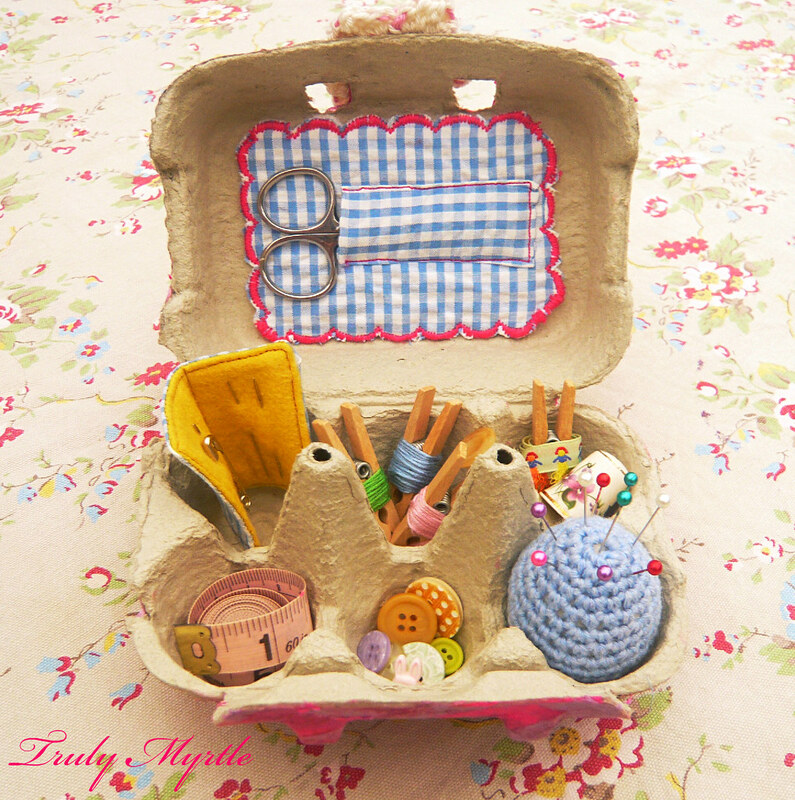 A wee sewing box and my foray into the world of crochet! I would love to try more but I do have to work at the basics. It might be because I am left-handed, but I struggle with holding everything comfortably and achieving good tension. 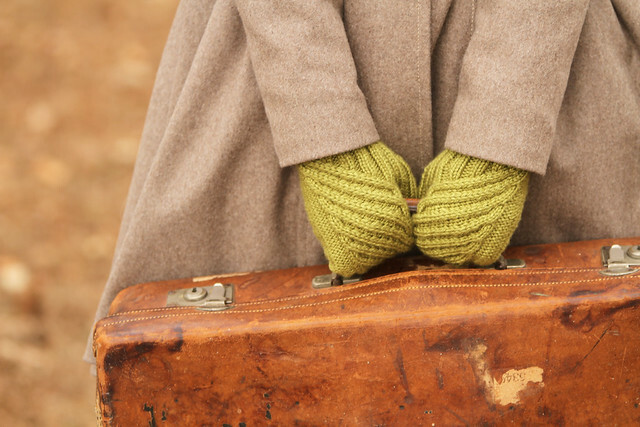 I knit right-handed and hold the yarn in my right hand wrapped around my little finger and over my index finger. With crochet, I hold the hook in my right hand and the yarn in my left. I find it really hard to get comfortable and let the yarn smoothly feed through my fingers. I'd love your help! Do you have any tips? Is it just me, or just practice? Can you point me in the direction of some good instructions? You can give me all your advice in the comments bit at the bottom of this post. Thank you! Well folks, we're done. 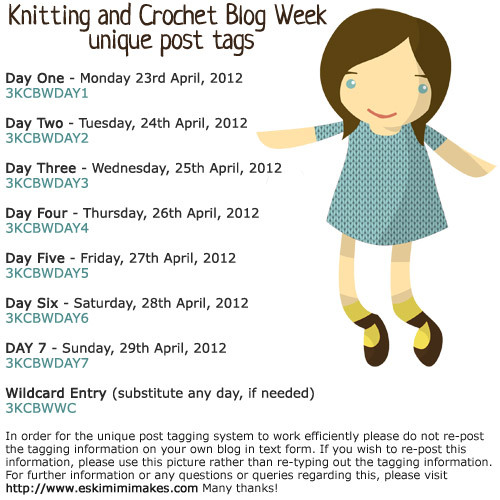 It's the end of Knitting & Crochet Blog Week 2012. Thank you everyone who popped in to see what I was up to. I hope you enjoyed my posts. I've loved your comments! If you want to see what else is happening today search 3KCBWDAY7. I have dipped my toe (albeit my littlest one!) into the world of knitwear design recently and published my very first (free) pattern Flower Power Headband, which was super fun, but aside from that, have experimented with pattern writing only a little. But, today, day six of Knitting and Crochet Blog Week, I declare that everything is about to change! I am going to fetch my calculator, my yarn and my needles, gather my numerous books around me, ask lots of questions on Ravelry, and most importantly of all, ignore my fear and have a go at designing something lovely. Oh yes, I am. 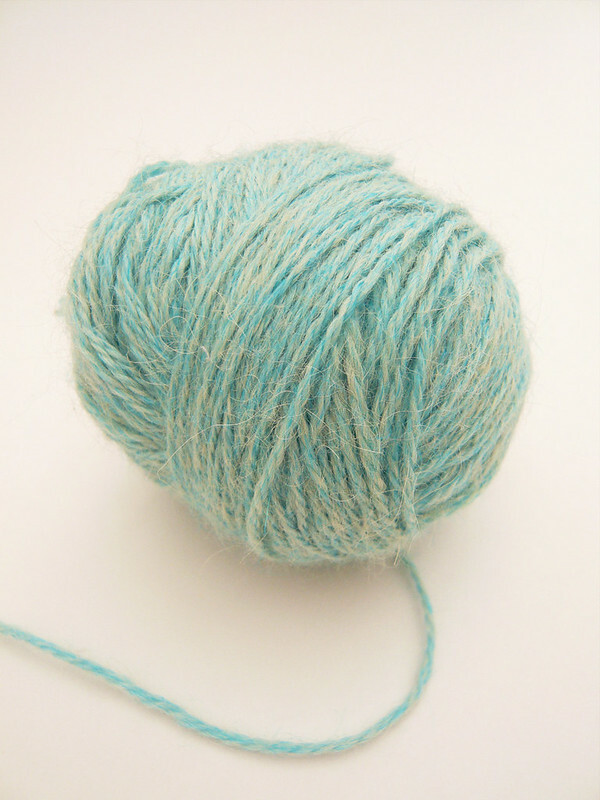 Do you remember this lovely ball of yarn? 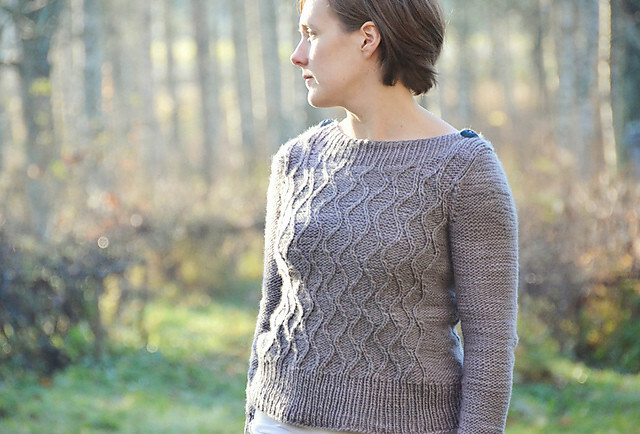 It's Artesano 4ply Alpaca in Anemone from Peru. The ball is a little smaller now because I have knitted a swatch. This little swatch is the beginning of my challenge. To design something lovely. But what? 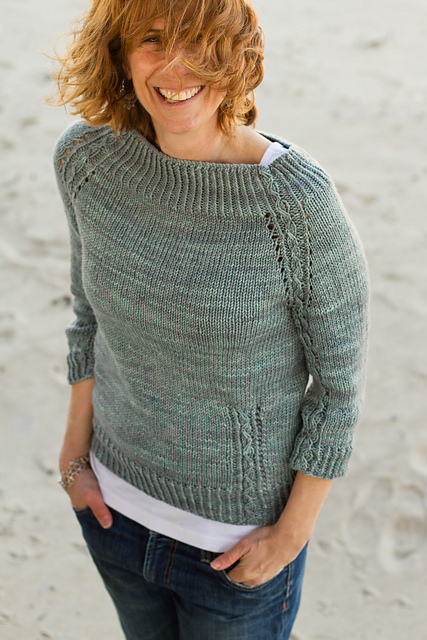 Maggie Righetti introduced me to the idea of listening to what my yarn is telling me, in her book Sweater Design in Plain English. I love this idea. It feels like such an organic approach and for me, removes some of the pressure to "get it right". So I knitted, and tried to listen. Sure enough, this yarn let me know what it needed. It doesn't want to be knitted into a baby hat, like I had thought. 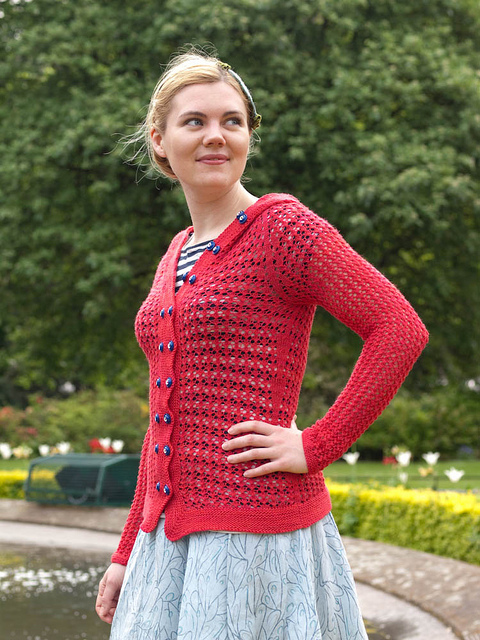 It wants to be a wee summery cardigan for a little girl. Hmmm. Okay. What else? 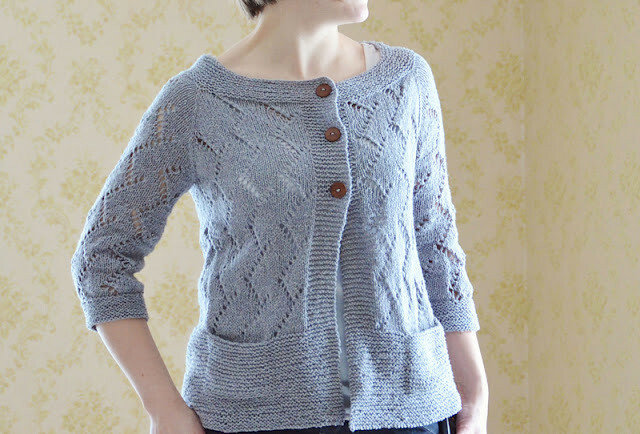 It wants slightly puffed sleeves, in garter stitch. It's happy for the rest of its body to be stocking stitch, provided it has a pretty, curved border. It's thinking moss stitch, or something like that. Maybe some eyelets. It might like a button closure, but only one, and it hasn't definitely decided that yet. Pretty cool huh?! But now it's up to me to get this pattern rolling. To get started, my books tell me, I need to grab a ruler. This is where I start to waiver. (And, looking at that photo, so does my knitting!) Am I counting correctly? It all depends on the swatch right? Accurate numbers and all that. I am more of a big picture, ideas person. Detail is not my strongest point. I am hoping to glean some knowledge from your experience. Will you help me learn? Will you tell me your design tips and let me know if I am going wrong! Sorry to the folks who love inches, but I work in metric in my head and, as I'm feeling slight panic right now, to avoid any extra stress, I'm going with centimetres. I can convert it all to inches later... My blocked swatch tells me that in size 3mm needles, my yarn knits into a nice looking stocking stitch and its gauge measures 28.5 stitches over 10cm. So far so good. 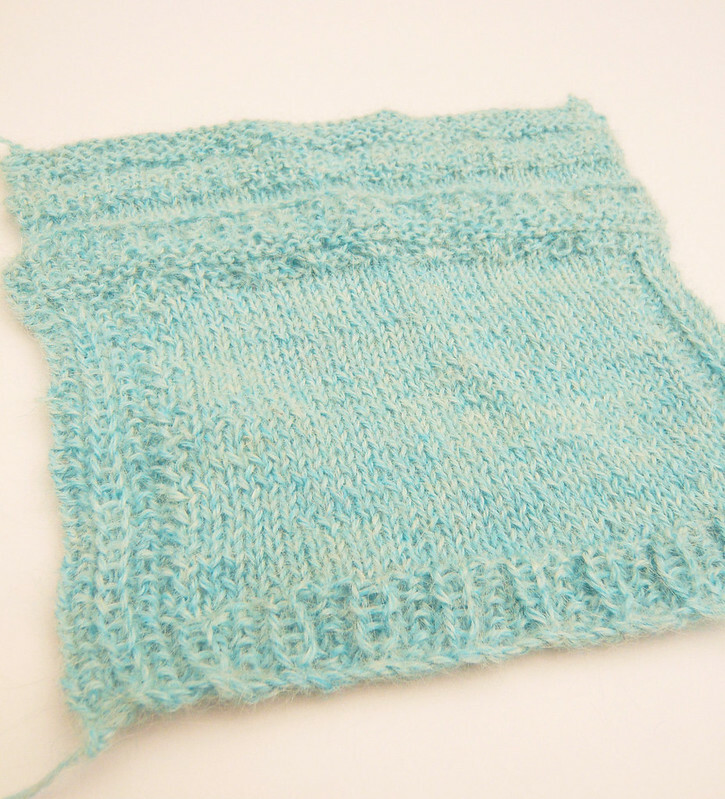 It's slightly different in the garter stitch, where it measures 26 stitches over 10cm. It's fuller where there is garter, perfect for the sleeves. Lengthwise I have made a bit of a boo boo because I didn't knit quite enough, only 9.5cm. Whoops! Oh well, it's measuring 35 rows over that 9.5cms. Let's hope that doesn't totally muck things up... will it? So, hopefully that's my first bit done. Swatch and gauge. My next task is to pin down the littlest person in our house and measure her. This sounds like the easy part. You might be surprised. I thought I'd make something for her for Project Run & Play this week. I know, am I crazy doing that as well as Knitting Blog Week, or what? Anyhow, it turns out I am. She flatly refused to try on the partly finished dress I'd made her out of beautiful red wool (more recycled Sweater... Earth Week, upcycling, my perfect challenge!) and I had to abandon the idea. If she wouldn't even put on the dress, there was no chance this two year old could be persuaded to pose for photos. But back to my lovely design challenge. Given that I tend to invent stuff as I go along, I thought I'd make this challenge a little one ....that way there will be less to frog... And anyway, my yarn told me it wanted to be snuggled around a very little person. Well, I don't know about you, but I knit whatever the weather. Hot, cold or in between, click, click, click go my needles. 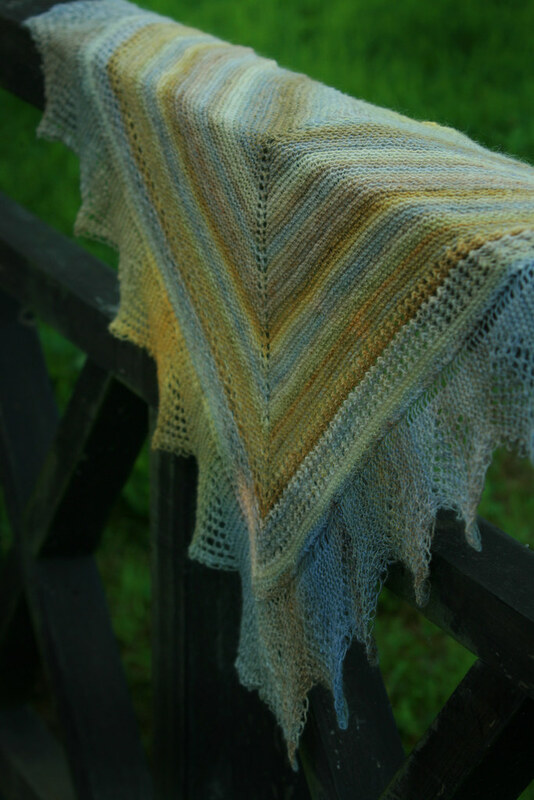 One very hot summer a few years ago I knitted beside beaches and swimming pools all over Europe. I did get a few funny looks, but I hid behind my sunglasses and managed to get a bunch of cardigans and sweaters finished for my two big kids, ready for their first cold English winter. Usually I knit according to the weather outside. Or at least I save bigger projects for cooler weather. Last year I knitted a couple of pairs of socks while we were camping. In really hot weather they are the perfect item to knit. Light and small, quick satisfaction. In contrast, during the winter, nothing is nicer than a lap full of scrummy warm wool. So, what is on my needles during this wet and chilly spring weather we're having now? 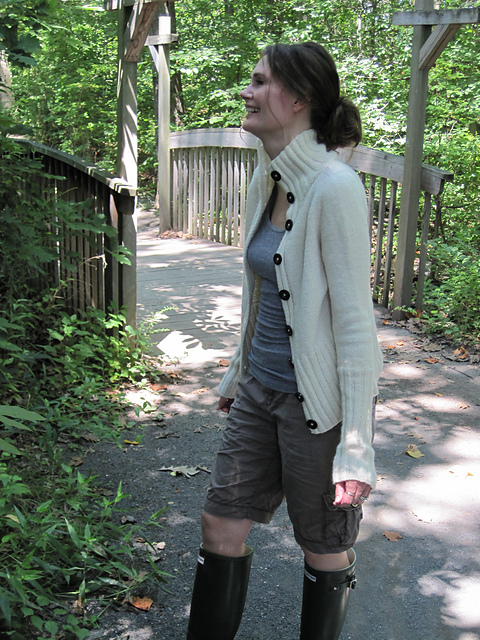 My "main" knitting is my silver Buttercup for the luvinthemommyhood tops, tanks & tees knit along. To be honest I have had mixed feelings about this knit. I started with a hiss and a roar; zooming down from the neck, joining it in the round, enjoying the lace along the front and then splitting the body from the sleeves. And then I tried it on and... it was too big! You see, I am at the bottom end of one size, but the next size down is just too small. I contemplated going down a size but then thought to check my gauge. What was this! I was off.... by TWO whole stitches!!! How did that happen? My swatch was okay... I even did the fancy swatching in the round technique suggested by Jane Richmond. In the end, I decided it was the toddler's fault. She jumps on and off my lap in the evenings and my knitting goes all lax. My Wispi is also still ticking along. It's on a holder right now because I've pinched the needle tips for my Buttercup. But it is slooooowly growing. I did say this would be background knitting, and it is! I pick it up when I don't have something else handy... I'm still loving the colour! So far, I've made it down the arm and am working my way across my back. Remember how I had plans to adjust the pattern? I want longer, fitted sleeves and I've knitted them in the round. So far, my number crunching is working out okay. I'm knitting the Women's medium size and I cast on 52 stitches instead of the 78 required. I popped a stitch marker bang in the middle and knitted in the round, increasing either side of the marker every 8 rows, until I had 78 stitches. I've used the Elizabeth Zimmerman M1 increase which looks great. 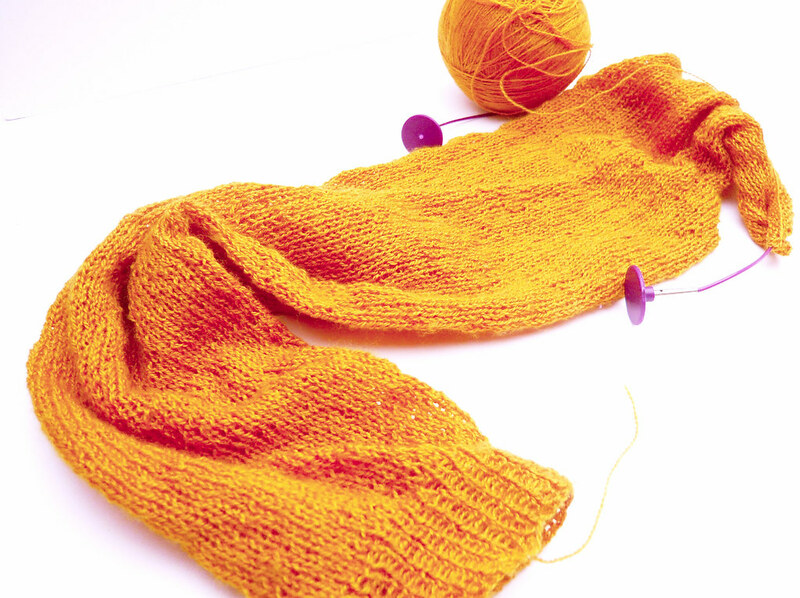 Once I reached 78 stitches I tried the sleeve on and decided that I wanted it even longer, so I kept knitting round after round, trying it on, then knitting more and more, until it was as long as I wanted it. In the end I have a super long sleeve, 53.5cm/21" from my armpit to cuff. Now I am following the pattern, knitting flat, till I get to the other side of the back. Then I have to remember what I did for the first sleeve.... and do it backwards. Wish me luck!